Distinctively different, but equally sweet. From left to right: Cyrus, Clive, Ralphie and Graham Loudermilk. So cute - Would love to take little Clive the black and white kitty! It never ceases to amaze me how kittens from the same litter can look so different from each other. I love the look on Cyrus' face in the last photo. He appears to be very distrubed that his sibs aren't posing properly. I am also trying to figure out if I want an orange or buff kitty next? (If that mattered - I haven't picked out a kitty in a long time - they just happen). Aww, they are Whole milk, 2% fat, Fat-free, and buttermilk! Cyrus seems to have no idea at all what you're doing. He's the only one that doesn't look away and he truly looks puzzled. I wonder if he will forever look amazed? Cyrus' eyes are so expressive. I also love Grahams whispered comment in Ralphie's ear...maybe chatting about MIss Charlene? I couldn't resist. I made an animated gif of these pics. Great little group of goodness! They're all so very cute! They are all truly adorable, but Cyrus is killing me here. The eyes! I think Cyrus has to be my favorite from this litter. What a cutie. Of course, they are all cute. Darling boys. Can't wait to see Bean with them. 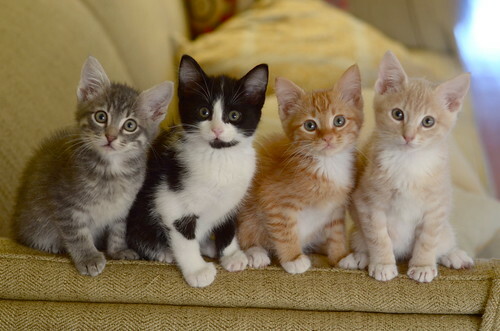 I think this group of brothers has the cutest little paws I've ever seen. And they're all holding them very similarly! 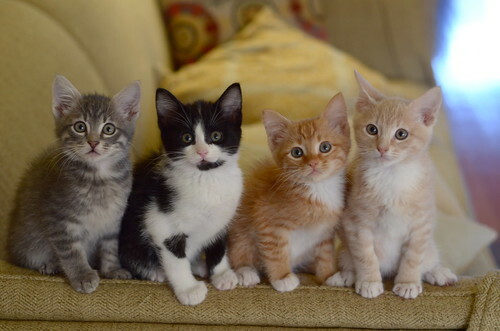 How do you ever get your kitties to pose in a row? I can't even get my two fuzzy boys to stand next to each other for 10 seconds. Inquiring minds want to know! I take photos for our local shelter, and I have a hard time getting ONE kitten to stay still long enough to get a good shot. I don't even try to get the entire litter to cooperate. I am in awe at your kitten-wrangling skills, Laurie. Although Cyrus is clearly taking his job very seriously. He appears to be very concerned over Ralphie's nonchalance about the whole thing. It's amazing how personalities can show so clearly in your photos! They are so cute, and I just melt when I look at the last photo! The look on Cyrus' and Graham's faces are priceless! Super Cute! The four of them are so different. What a distinguished group. The League of Extraordinary Kittehs!! I think The Kitten Whisperer must have come into the room right before that last picture, distracting the kittens - all, that is, but Cyrus who showed his Granddad how well he can concentrate on the task at hand! Now my mom-person sounds strange again !! 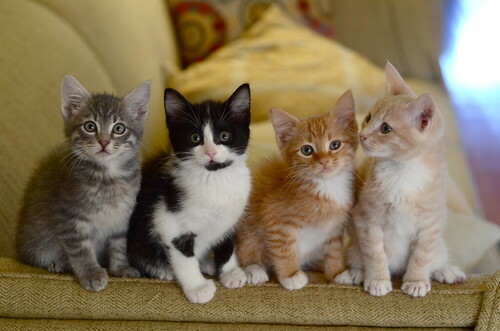 Truly amazing that you get these kittens to sit still!! You couldn't do that well with human 2 year olds. It's official, Graham has completely stolen my heart. Any Frost updates from the Kitten Whisperer? 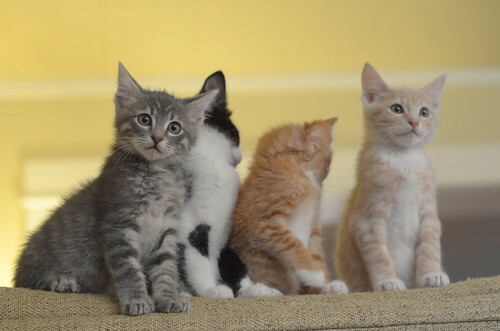 They look like very serious kittens. And despite my love of tuxies, I believe Ralphie is my favorite! i love how the photo shoot just sort of disintegrates... thanks for my morning fix!